Gab is a social media site that has been described as an alt-right safe space. Founders maintain that it’s intended as a place for free speech, where those who want to talk about things often banned on other social media sites — like attacks based on race, ethnicity, and gender — can do so without fear of censorship. Now it may not be so ‘safe’ for neo-Nazi talking points after all. 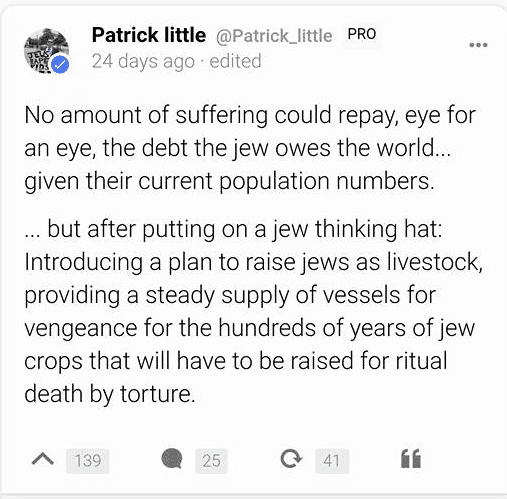 The site where users go after they’ve been banned from other platforms for hate speech, is at risk of being removed, and antisemitic posts may be its undoing. …demonstrate a sufficient level of moderation, including for content that encourages violence and advocates hate against groups of people. Earlier this week, founder Andrew Torba appeared on Alex Jones’ conspiracy-promoting InfoWars, to discuss ‘anti-free speech,’ specifically addressing removal of certain content from social media. Alex Jones had his pages removed from multiple social media platforms, over such activity as calling the families of children who were murdered in Sandy Hook Elementary ‘crisis actors’ and posting conspiracy theories that led to harassment of these victims. On his show, Jones told Torba he’s been falsely accused of attacking children because he says drag queens are putting on strip shows and having 3-year-old children stuffing money in their g-strings. Aside from this not being the offense for which Jones is accused of bullying children, it also is not actually happening. Jones and Torba discussed their agreement that Donald Trump should act to protect Jones from the ‘bullying’ of corporations refusing to do business with him. Now, following that show being aired, Torba says that his webhost, Microsoft Azure, is threatening to take down his site over two anti-Semitic posts. Though the warning, which Gab’s Twitter account shared in screenshots Thursday, focuses on two URLs being connected to phishing complaints, Torba believes it’s an attack because he spoke with Alex Jones and hosts Jones on his platform. In fact, the posts in question, now deleted, were arguably egregious. Both were by the same user. One called for treating Jewish people as livestock, and the other was a promise to destroy a Holocaust memorial. 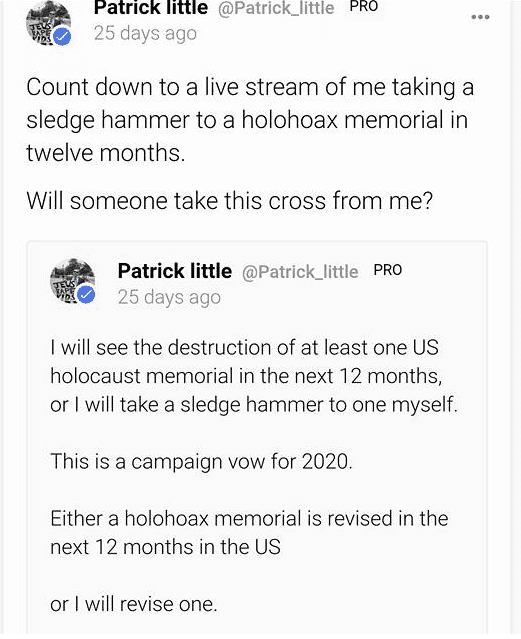 See screenshots of the two posts below as they appeared on the Gab website. Archived copies of the posts are here and here. Gab announced Thursday, only a few hours after they shared their 48-hour warning, that the posts had been voluntarily removed. However, if scrutiny of the site is starting to result in complaints to the web host, this could still be the beginning of the end for one alt-right safe space.